[Oval:] GENEROSISS Dn. Dn. 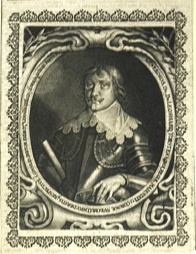 LEONHARD TORSTENSOHN, REGIAE MAIESTATI CORONAE SUECLAE CONFOEDERATIS RESPECTIVE A CONSILÜS, DUCTOR EXERCIT IN GERMAIA GERALIS, GEERALIS GUBERN, POMERA.